VBOT (1985) Design, Construction & Driver: Peter Asaro. 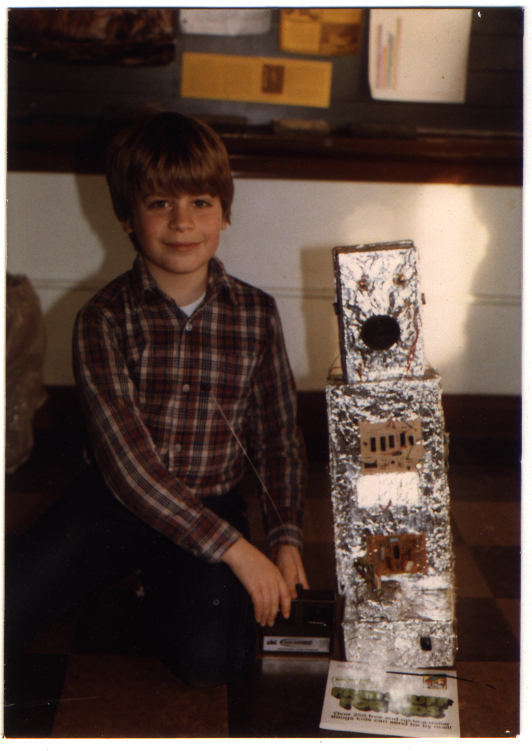 I built this robot in response to an assignment made by my 4th Grade teacher, Mrs. Panther, to design and build a mailbox for the exchange of Valentine's Day letters amoungst our classmates. The robot's base, body and head were constructed of shoeboxes, the largest for collecting Valentine cards via a covered slot on the front of the robot. The circuit bords and speaker were canabalized from a clock radio, and were non-functional. The eyes were light bulbs powered by a 9V battery. The body was secured to an R/C tank, powered by batteries and controlled by a hand-held radio control unit. It won the "Best Valentine's Mailbox" Competition for Mrs. Panther's 4th Grade class, as voted by the students.